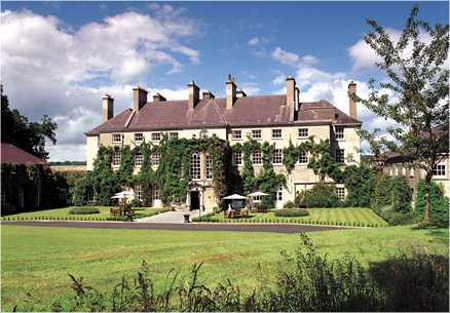 The Mount Juliet hotel is set on a 1500 acre estate in Kilkenny. The Mount Juliet Estate is famous for its country pursuits and fishing, hunting, shooting and equestrian sports are all available.The Mount Juliet Hotel and estate is located close to Thomastown in County Kilkenny and is just 10 minutes from Croan Cottages in the south-east of historic County Kilkenny in Ireland. The Georgian Mount Juliet House is an excellent place to spend some time while staying in our self catering cottages. Our guests often visit the Mount Juliet Hotel to enjoy a meal or a relaxing afternoon coffee. Formal and informal dining are available at Mount Juliet. The award-winning restaurants of the Mount Juliet luxury hotel include Lady Helen Dining Room, offering international and creative cuisine and Kendal’s Restaurant, in The Hunters Yard, where you can enjoy a more relaxed atmosphere. The leisure activities offered by the Mount Juliet hotel and estate are not just available to guests of the Hotel but can also be enjoyed by those staying elsewhere in Kilkenny, including at Croan self catering cottages. Many of the guests staying in our self catering accommodation have enjoyed horseback riding and fishing in the River Nore, archery, clay pigeon shooting and golf on the Mount Juliet estate. The 18-hole championship golf course of the Mount Juliet Conrad hotel is one of the most prestigious golf courses in Ireland and was designed by Jack Nicklaus. The Mount Juliet golf course is just 10 minutes from Croan Cottages and has hosted three Irish Open Championships as well as the AMEX World Golf Championships. So many of the services of one of the most prestigious luxury hotels in Kilkenny, Ireland, the Mount Juliet, can also be enjoyed by guests at Croan Cottages.